Each-way bets are basically one bet for the selection to win and one bet to place. It’s commonly used in markets for horse racing, golf and greyhounds to name a few, or tournament markets in general. 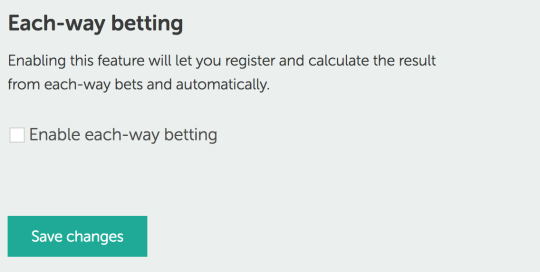 To activate each-way betting at Bettin.gs, go to your Settings page and check the “Enable each-way betting” checkbox. You will then see a few more options the next time you register a bet. 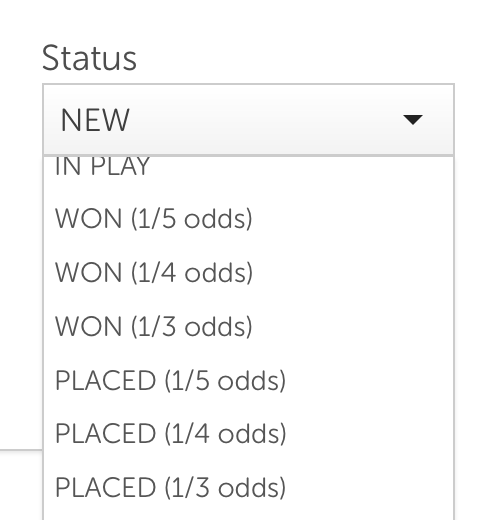 When you register your each-way bet make, simply check the “Each-way” checkbox and enter the stake as usual. Note that the stake you enter is the value for the win and then place part respectively, so the total stake will be twice the one you enter. Also note that it’s the stake you enter, not the liability. When you settle your bet, you will have the option to set it as WON or LOST as usual, but also select PLACE. This is also where you set the terms for the place bet (the odds offered). The result and stats will be automatically calculated based on the info you entered.